I’ve set literally thousands of tables in my lifetime, and that’s not an exaggeration. In high school I held a part-time job as a food server and waitress in Arthur Andersen’s training center. Some of the banquets were fancy and everything had to be perfect; it’s an art form. A beautiful tablescape combines form with function to create an enjoyable dining experience. I always enjoy putting a table setting together. 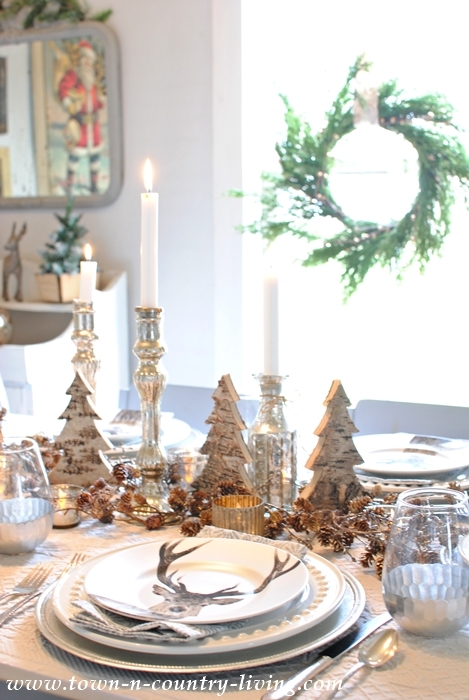 My creation is a deer table setting for Christmas; and I’m sharing my thought process for pulling it all together. 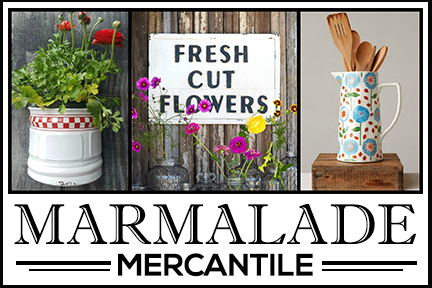 Start with a theme when creating your next table setting. 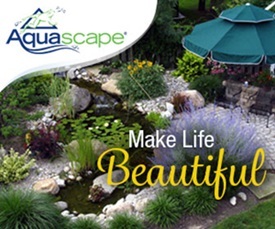 Choose a style, color scheme, or topic to create the look you want and then stick to it. 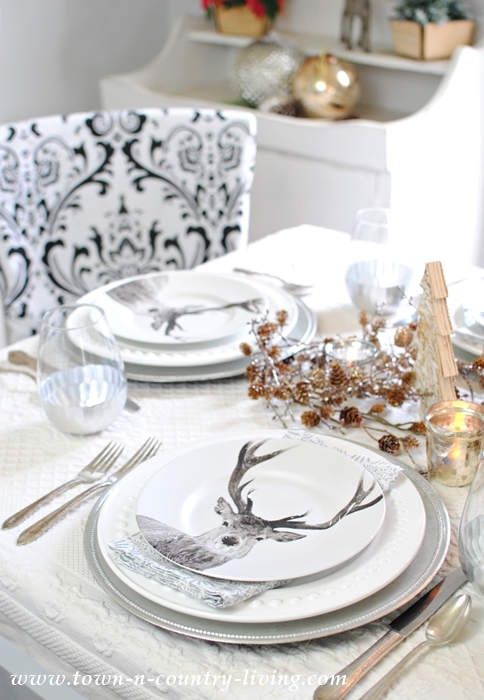 I first spied these beautiful deer plates at Pier 1 and knew right away my theme would revolve around deer. 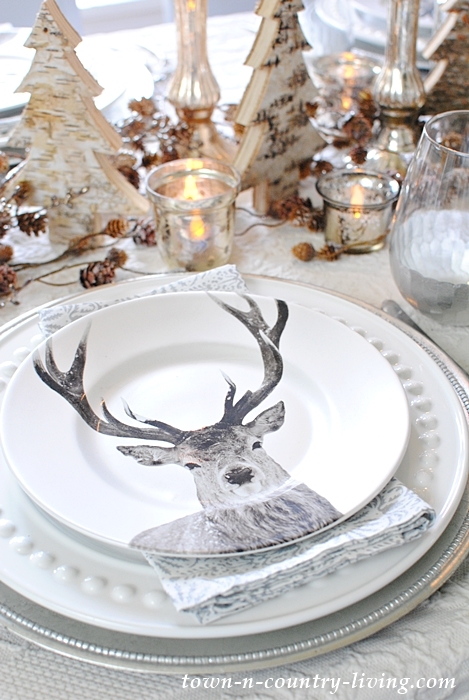 I love that the buck’s face looks so realistic, as though an artist painted it right on the plate. 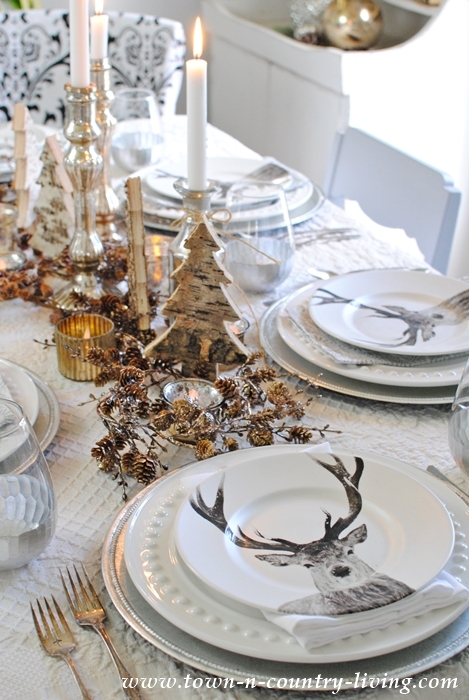 The color scheme of my deer table setting remains neutral since the plates are mono-toned. Normally I like color but I didn’t want to detract from the beauty of the stag head. Silver chargers cradle the plates while silver-dipped plates add a small bit of bling to the table. 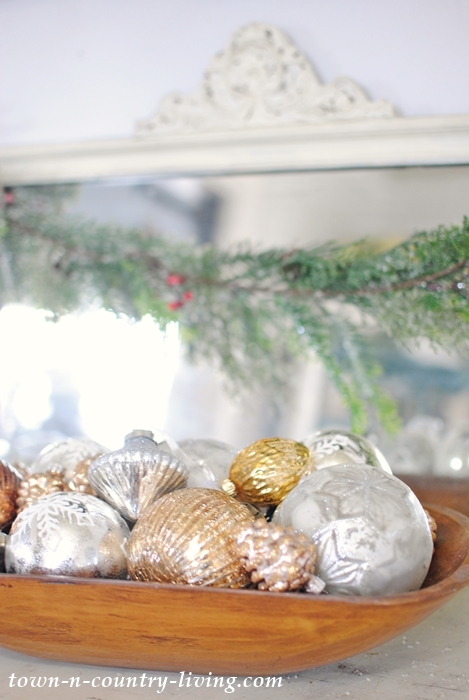 I love mixing metallic colors so a hint of bronze acorns wind their way down the center of the table. Acorns, of course, are found in the woods where the deer live. Bark-finish evergreen trees lend rusticity and also call a woodland to mind. 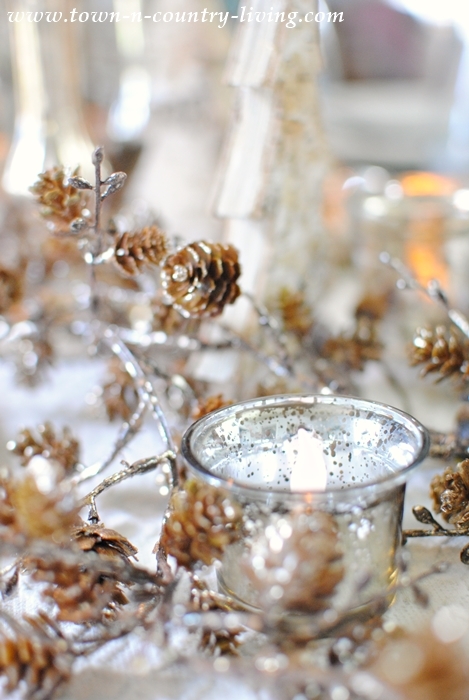 Candles are always a sure-fire bet when creating a centerpiece for your holiday table. 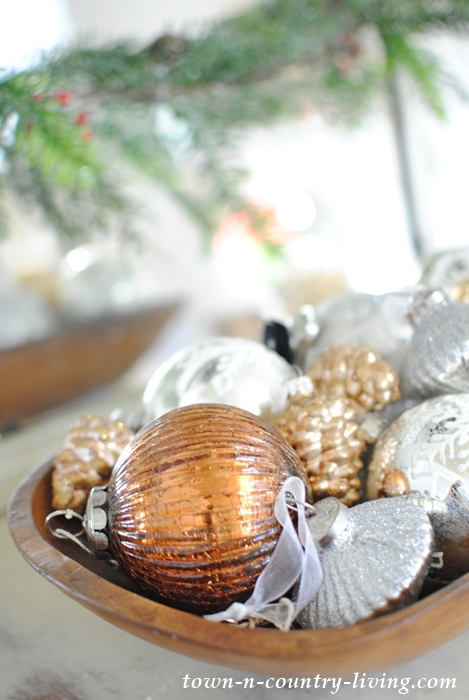 Add flowers or greenery, or simply use candles alone to cast a cozy glow over your Christmas table. 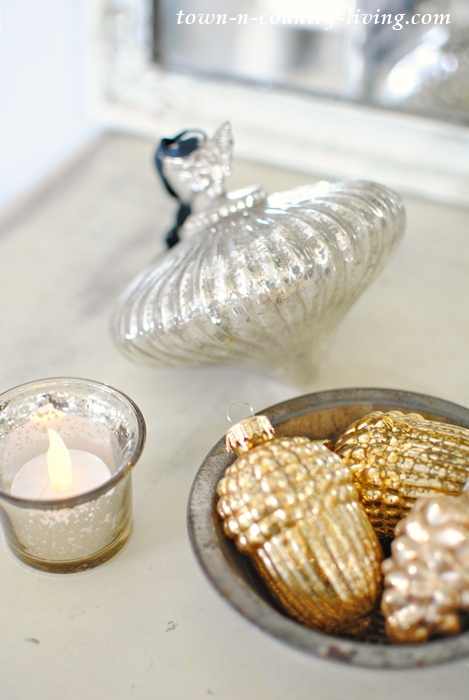 Sparkly surfaces like mercury glass candle holders and votives create reflective surfaces for the candle’s flame. I’ve been busy decorating my house for Christmas, in addition to planning my deer table setting. 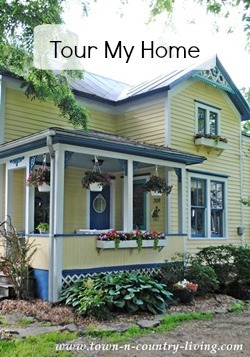 My Christmas home tour is tomorrow and I hope you’ll come back to visit. Simply magical….looks like a fairy came and sprinkled her fairy dust all over your beautiful table….fabulous!! Trying this one more time…. Fabulous! looks like a fairy came and sprinkled her fairy dust all over your table, just love it! 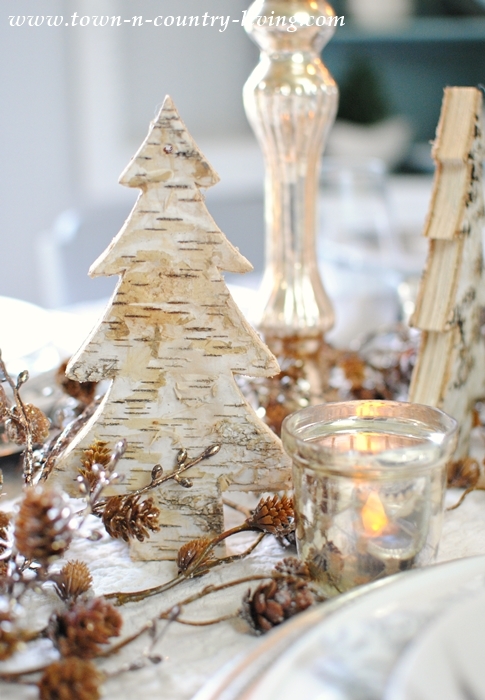 What a lovely woodsy tablescape! 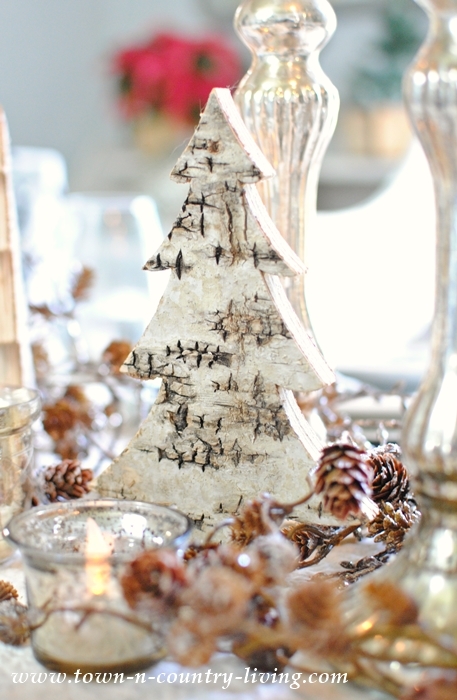 I especially love those birch bark trees! Beautiful! 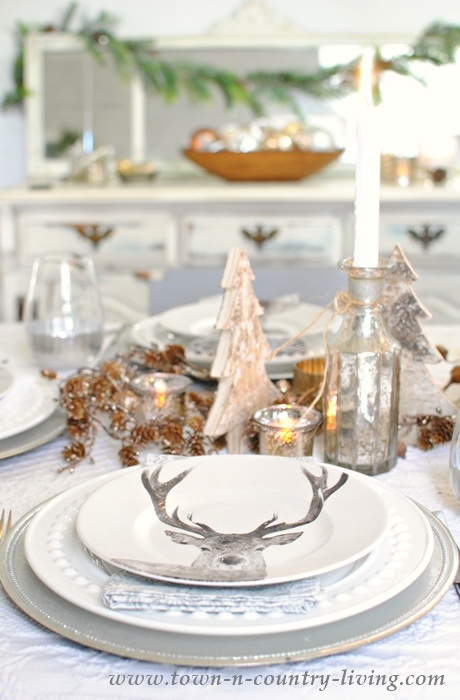 LOVE those deer plates and the woodsy feel, just beautiful! Beautiful!!! I love the glittery winter wonderland look!!! 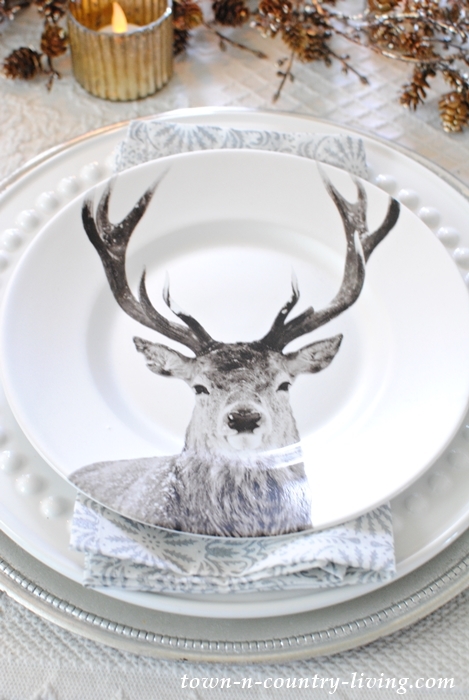 Pier One has really stepped up their game with these lovely deer head plates. I adore this woodland setting Jennifer!! It couldn’t be prettier. 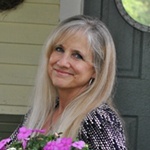 Jennifer I love your woodland theme, it’s so magical for Christmas and juxtaposing all the metallic ornaments with it is simply beautiful! Wonderful table! Beautiful Jennifer! Your palette of silver & gold is a favorite of mine. Merry Christmas to you & yours! Very beautiful. It looks so wintery. Is that a word. I LOVE IT. The mix of metallics and the linens are so soft. I think that chair looks different too? Well done. 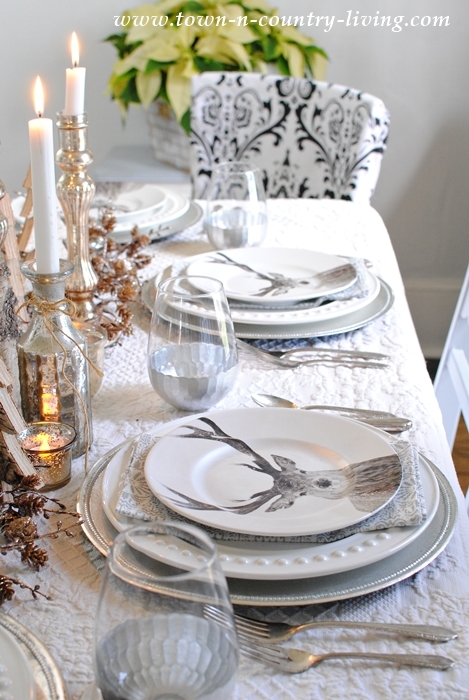 So pretty- I love those deer plates! Oh my gosh, I love those plates so much and everything you did with your table to tie it all together! Happy holidays! 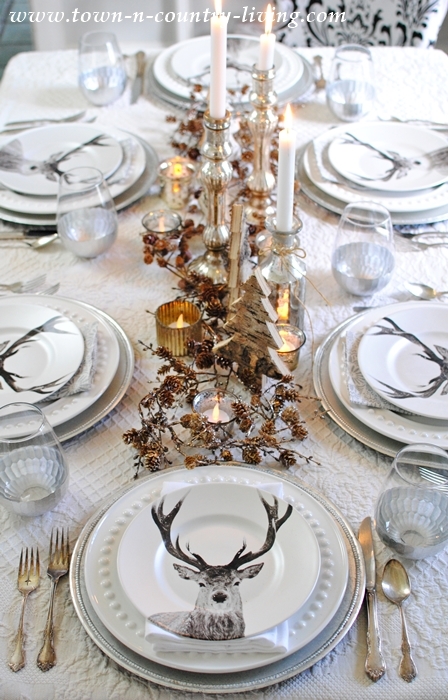 This table is lovely and I am not usually a fan of things with deer for Christmas. Usually to cutesy for me but these are gorgeous, very stately to me. You did a fantastic job. Simply beautiful! can you share your source for the birch trees? It’s so beautiful, Jennifer. Happy holidays! Very Beautiful!! Do you know the name of the plate (under the deer plate) with the bumps around the edge and where I can find it. Thank you. Merry Christmas!! Love this! Where did you get your napkins and tablecloth?